Content Advisory: This page includes images of child patients. The SmartKlamp is only used for infant and childhood circumcisions. 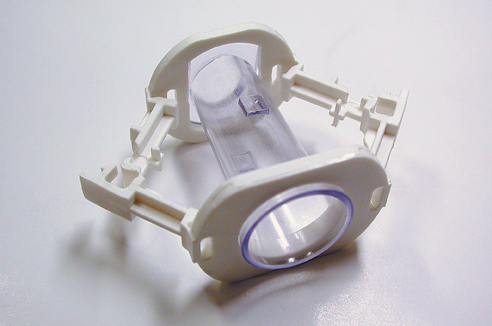 This clamp was developed in the second half of the 1990s as a commercial rival to the Tara KLamp. Whilst the Tara KLamp is a one piece moulding, the SmartKlamp comes in two parts that are made of different materials. Both are “Fit-&-Wear” devices that function in a similar way - the clamp crushes the foreskin between two plastic surfaces, forcing scar formation at the crush line. The glans is first measured using the ‘Size-O-Meter’ to determine which size device is required. Any adhesions are broken down and the tube part is inserted between the glans and the foreskin, which is then pulled up onto the transparent tube. The white outer component is passed over the tube and rotated a quarter turn to lock the tube to it. The locking arms are then half-closed in order to lightly hold the foreskin whilst the device is adjusted appropriately for the desired style of circumcision. Very tight styles can be achieved with this type of clamp. Once positioned, the locking arms are clicked completely shut and the excess foreskin is removed from in front of the locking ring. The device can be left to fall off by itself in about a week or the doctor can remove it after a few days. If healing progresses normally, no sutures are required at any stage of the process. The transparent component is inserted beneath the foreskin. The line marks the intended amount of residual shaft skin; when fitted and latched the outer component should just cover it. 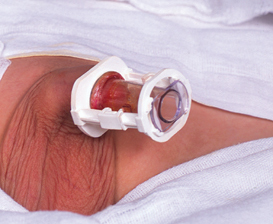 This image shows the result of a tight circumcision with a SmartKlamp, done at the onset of puberty and seen here immediately after removal of the clamp. The necrotic ring falls off after a few days, revealing the sulcus. Experimental SmartKlamps in adult sizes. Apparently for financial reasons, Circumvent BV was wound up. Manufacture of the SmartKlamp always has taken place in the Far East, initially in Singapore. After an absence from the market following the collapse of Circumvent BV, the product re-emerged in Malaysia and it is there that the current distributors are based. For more information visit the distributor’s website, http://smartcircumcision.com/index.html. 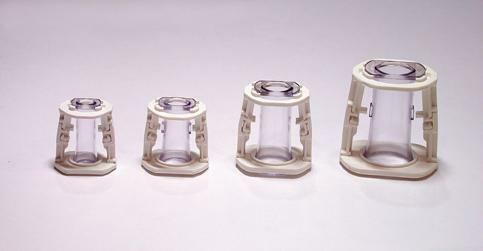 Sizes now available are 10, 13, 16, 20 and 25mm diameter. The Size-O-Meter device has been redesigned accordingly. 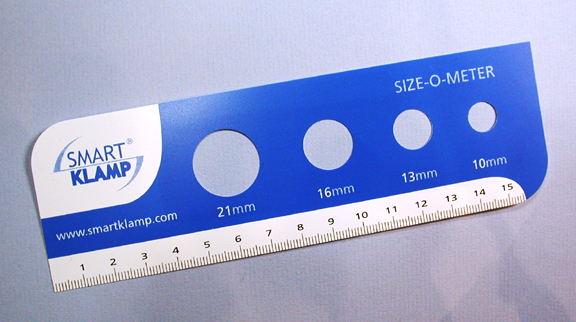 The 25mm size can be used mid-puberty, but it is not suitable for a mature adult male. The FDA documentation for the SmartKlamp, linked from the Acknowledgements section below, is rather curious. The applicant, at the time the manufacturer’s representative in the USA, used the “512(K)” procedure to obtain accreditation. This involves a claim of substantial equivalence to other pre-existing devices, which may themselves either be specifically approved or historic (historic in the sense of being in common and safe use before the FDA accreditation process was created). 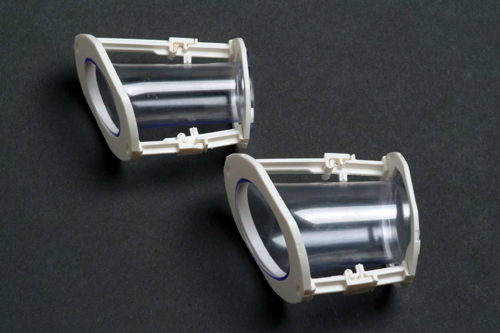 The SmartKlamp’s FDA approval (reference number K032091) was based on a claim of equivalence to the Kilejian Circumcisor, the Gomco Circumcision Clamp, the Mogan [sic] Circumcision Clamp and the Hollister Plastibell. Of the four that were listed, only the Plastibell is a fit-&-wear device. The Kilejian Circumcisor obtained its own FDA approval via the 512(K) equivalence procedure, citing similarity to the Gomco device and thus adding little to the argument in favour of approval of the SmartKlamp. This does appear to show a rather lax approach to the issue by the FDA. Note: Circumcision should always be performed by a trained and skilled healthcare provider. Readers are cautioned against obtaining this or any other circumcision clamp via mail order and then using it on a DIY basis. UK Intellectual Property Office record for Malaysian patent 0100375 dated 30.Jan.2001. Company records of the Dutch Chamber of Commerce. USFDA Registration of the original SmartKlamp. Website of the current Malaysian distributor. Publicity video of Circumvent BV, produced under the direction of Dr. Harrie van Baars. Copyright © 1992 - 2015, All Rights Reserved CIRCLIST.